Why Is My Shoulder Stiff After Rotator Cuff Surgery? (Video) - Jeffrey H. Berg, M.D. In prior posts, I have discussed what rotator cuff tears are, what causes them and how they are best treated, both non operatively and with rotator cuff surgery. What I haven’t yet discussed, in detail, are the problems that can occur with rotator cuff tear treatment. Paramount among those problems is stiffness. Stiffness unfortunately often occurs after both nonoperative rotator cuff tear treatment and after rotator cuff surgery. Let’s take a look at the latter. Surgery for a rotator cuff tear involves tying the torn rotator cuff tendon to the humerus where it has pulled off from. The tendon needs at least three months to heal to the humerus. Until then, it must remain securely tied to the bone. As a result, the postoperative treatment starts out slowly. Typically the arm is supported in a sling for 4-6 weeks. Although therapy is usually started shortly after surgery, it usually progresses cautiously for the first three months, limiting motion and stress on the repair. All of this is done to try to prevent a catastrophic failure of the repair. There are a number of reasons that the shoulder may become stiff after rotator cuff surgery. One of the leading reasons is the common post operative course that I described above. In essence, early on, your surgeon is trying to thread the needle between limiting shoulder activity so as to maximize tendon to bone healing while trying to move the shoulder as much as possible in order to reduce the risk of postoperative stiffness. This restriction, although giving a better chance for your rotator cuff to heal, can often lead to stiffness all by itself. Why? Well joints in general tend to get stiff after trauma…and surgery is traumatic. Many of the joints’ soft tissues tend to shorten and stiffen. Why this happens, we don’t know. But it happens. Additionally, without much motion, scar tissue has time to develop. This can sometimes result in thick bands that may connect the humerus to other stable areas of the shoulder and restrict, or in some cases prevent, motion. Furthermore this phenomena is more common in some joints than others. For instance, the knee stiffens more than the hip. And as a general rule, the upper extremity more than the lower. Specifically, the shoulder tends to get really stiff after trauma…and surgery. Secondly, there is also the potential for not only stiffness to develop as we discussed above but an actual secondary frozen shoulder may as well. Many of the groups susceptible to frozen shoulder, also commonly have rotator cuff tears and ultimately rotator cuff surgery: the middle aged, following trauma, and of course, following surgery, for example. Rotator cuff surgery is very painful. We do many things to reduce the pain but the surgery and particularly the recovery, is still painful. Additionally, the recovery is long. Recovering from rotator cuff surgery is not a sprint but rather a marathon…and a painful one at that. Pain can prevent effort…or limit it. And recovering from rotator cuff surgery and reducing or preventing stiffness requires effort…and lots of it. So if your in pain and can’t perform the rehab that’s needed, your shoulder may stiffen from any or all of the reasons discussed above. As you stiffen, the greater your pain will be when moving your shoulder and the more effort that will be needed to overcome the stiffness. So pain can lead to a vicious cycle of progressive increased pain and stiffness, feeding on itself and causing even greater pain and stiffness. So the question really isn’t “Why is my shoulder stiff after rotator cuff surgery?” but rather “Why isn’t it?”. Stiffness of some degree is common. Not having any stiffness at any time is not. Recovering from rotator cuff surgery is like swimming against the current. With the current being your shoulder’ tendency to get stiff. With that said, stiffness early on is usually a good thing. Huh? Well the weak link in your repair is the repair. The tendon is attached to the bone by small stitches. Initially just tiny strings are holding your repair together. As the tendon heals to the bone, the repair becomes stronger and the stitches less relevant. But until then, if you gain too much motion, too soon, you probably gained that motion by pulling the repair apart. So stiffness early is usually a good thing. Fortunately, this stiffness often will work its way out with time, effort and continued physical therapy. Over time, your pain will usually decrease and your tissues themselves will often slowly begin to lengthen and loosen on their own. After the tendon heals to the bone, the pace and intensity of your therapy can and should be increased….leading to further gains in your shoulder’s range of motion. So if your shoulder has not become too stiff before this point, much, if not all of your motion may be regained. But when it isn’t, there are still other solutions. Sometimes the ultimate loss of motion is minimal. Most joints have extra motion. The shoulder more so than many. So a loss of some motion will often either not be noted or at least not be bothersome. Usually most activities, whether those needed for daily living or even recreation, will not be hampered. However if they are, a manipulation of your shoulder or a simple arthroscopic surgery can almost always restore your motion to satisfactory levels. Fortunately, this surgery is much simpler and easier to recover from than the initial rotator cuff surgery. For more about this common, complex issue, watch the following video in which The Two Boneheads, Dr. Howard Luks and myself, have another hopefully informative discussion in which we discuss this issue in detail. When do you start to get more aggressive with stiff shoulders post op? Iannotti, Williams, just about all surgeons now like 6 weeks in a sling/abduction splint, little to no movement. Start PT (PROM) there, add AAROM at 8 weeks for everything not “massive” (small to large tears). By 9-10 weeks patients are pretty stiff… all be it that at 3 months there is a pretty good tendon to bone healing mechanism established in a successful repair. Do you wait for 12 weeks or do you start more aggressive stretches at 8-10 weeks? improvement…and patient happiness…by 4-5 months. If I don’t see satisfactory and improving range of motion by 5 months, I confirm satisfactory tendon healing by MRI and if confirmed, I perform a manipulation. 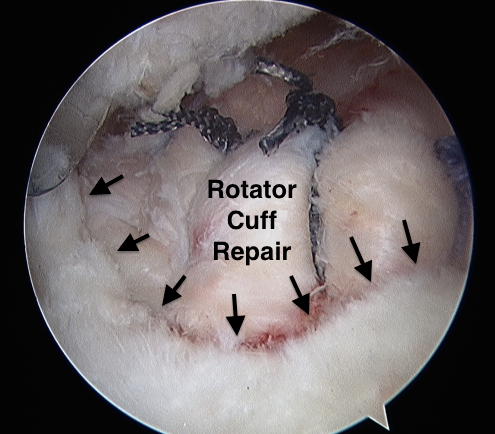 If unclear, I perform an arthroscopy and assess the rotator cuff repair integrity and lysis of adhesions.